Everyone who wants to do anything serious about music—that includes mere listening—must read Kafka’s “Josephine the Singer, or the Mouse Folk”. 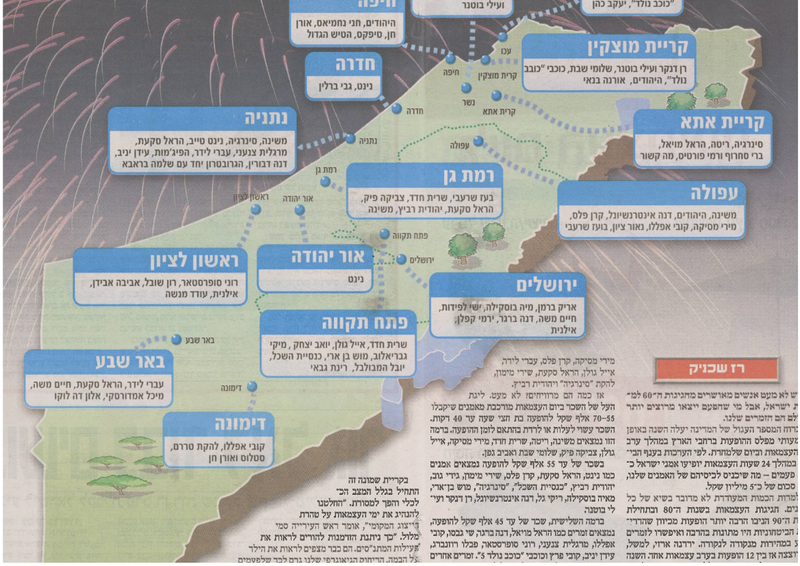 Today Yediot Akhronot published a map showing which artists will appear at the Independence day celebrations organized by municipalities around the country. Let’s take a good look at this map. Gush Katif is simply a part of Israel. Golan is also just a part of Israel. Judea and Samaria are demarcated with a green line—a pretty rare practice in Israeli mainstream newspapers, though it often appears in Haaretz. Now the craziest part: Afula and Petakh Tikva are way beyond the green line. (So is Jerusalem, but that’s a borderline case.) I just don’t have anything clever to say about it. The phattest bank in the world: Da Afghanistan Bank! YOU magazine (The Mail On Sunday supplement, UK? ), by Pete Silverton.